So you pull up to a gas station, looking to fuel up, but can’t figure out how to open the fuel door on the Chevy Traverse? Been there! Just use these steps. There is no release lever inside the cab. Exit the vehicle and locate the fuel door on the rear of the vehicle. Push inward on the rear side of the gas door. It will spring open, allowing you access to the gas cap. 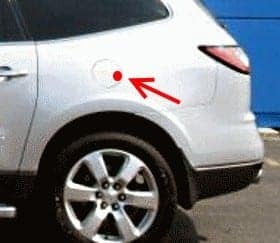 I just got a new 2017 traverse and am told it has no traditional gas cap??? ?